UKIP's former leader Nigel Farage is quitting the party amid a Brexit row. This is what Farage said as cited by The Telegraph. In November, Farage remarked that Britain's withdrawal arrangements added up to the "worst deal in history" for the UK. Sputnik has discussed this with Jerry Hicks, Trade Unionist, and political commentator. Sputnik: What do you make of the timing of Farage's exit from the party? Jerry Hicks: Well, Farage has probably been looking for an excuse for a long while to leave UKIP, which has been in terminal decline for a considerable period, primarily because the Tory party, the Conservatives, have gone further and further to the right and sucked up the UKIP votes, the racist and the disaffected. So, I think Farage seized upon the moment, but he would've gone in my view in any event, but he cites these particular reasons for him. To know the truth, I don't believe him, he cites these reasons with the current leader Gerard Batten and it is vile what he has done in bringing in the EDL (English Defence League) leader — Yaxley-Lennon — and Farage also says that he is dismayed that UKIP is going beyond the Muslim extremists and sort of targeting ordinary Muslims. Well, indeed, UKIP since its conception, in my view, has been a racist, scapegoating, divisive, and anti-Muslim party. So it's rich that Farage now chooses this time and cites these reasons. Although, of course, to bring in the EDL leader is horrendous, and my view is he should be in prison, not as a political commentator. Sputnik: What can you say about the way the party has actually changed under Gerard Batten, could you please comment a bit on what metamorphosis it has gone through? Jerry Hicks: Far too much time is given to them, particularly by the taxpayer-funded, me. I fund them, the state broadcaster the BBC who have had Farage on its political programmes, not least Question Time, more often than any other politician, and it continues to interview UKIP's people who have resigned or who are UKIP commentators. They get now wherever they stand a tiny percentage of vote, they are in terminal decline and have been for a while. They have no MPs and soon will have no MEPs when Britain is outside of the EU. So, my view is, that there's too much attention paid to UKIP and indeed Farage still makes the headline. Sputnik: Farage said that the party was actually turning a blind eye to extremist politics, would you agree with that? Jerry Hicks: Irony is certainly not dead. 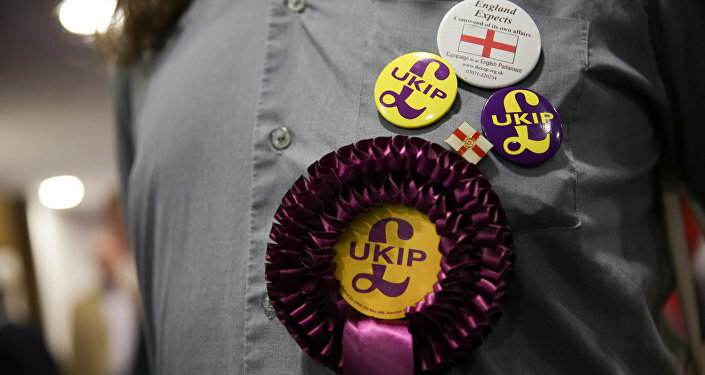 UKIP is extreme and becoming more extreme. Tommy Robinson, of course, is, in my view, very much a race-hate divisive figure. So, far from it, that UKIP are now turning a blind eye to extremism. Will a Resurgent SDP Supplant UKIP and the Lib Dems? I think they're becoming even more extreme, that's my particular view. But for Farage, the political opportunist, it may be that the timing is that he's come under the scrutiny of some American legislators just lately. So he might want to take the heat off that or the concentration off of that. And the Tory party, the Conservatives, are more extreme. They are far more far-right than they care to believe that they are, with their hostile environment, their austerity for 10 years, their policies of conscious cruelty, of mass homelessness, and of course, they scapegoat immigrations and immigrants as well. So, it seems to me that Nigel Farage is a good bedfellow for them. Sputnik: Very interesting Nigel Farage also said that UKIP was not the Brexit party that the country needed. What can you say about UKIP's stance on Brexit? Jerry Hicks: It's a dead parrot as the Monty Python sketch would have. Now it has ceased to exist. It is so insignificant, it's unbelievable. I'm sure it's still a Brexit party, of course, it is, it's anti-EU, it's anti-immigration, it's anti-Muslim, and so that's a nonsense. What it is, is insignificant and Farage he loves the big me-me-me. He loves being part of something that gets attention, and UKIP is just simply not fitting that bill. So he will talk about something else and, of course, he's getting attention. I'm talking about him today when I'd much rather be talking about Jeremy Corbyn and the Conservative government in absolute turmoil. It's in meltdown. Yesterday was a historic event, three defeats, one of which was the first time in history, the whole Tory government was held to be in contempt of Parliament. Farage, for all his furore, is in my view, as irrelevant as UKIP right now. Sputnik: So, many members have actually left the party, but some have stayed and some have even joined despite all of the bad press around the current leader. Why do you think that is? Jerry Hicks: The people that have joined, you need to ask them, but goodness me, in my view it must be because they are even more horrible than they ever were or possibly it's called entryism, where far-right extremist people of politics are seeking to enter UKIP. Sputnik: Nigel Farage has actually called for British politicians to prepare for this new Brexit party, what has he got in store? Jerry Hicks: Well, the one he'd be a leader of, I should think, so he can get on the BBC Question time and a number of other programmes. It's a farce and I think there are quite a few letters in farce as there are in Farage. There's a lot of similarities between the two, the name and the word. Maybe somebody like Jacob Rees-Mogg might be interested if he ever left the Tory party, but I doubt he'd ever do that. The right-wingers in the Tory party, if they stood as independents they'd lose their seats, and that's my opinion, which reaffirms the fact that Britain is not a right-wing country although we have a right-wing government. Views and opinions expressed in the article are those of Jerry Hicks and do not necessarily reflect those of Sputnik.